All Heating and Cooling has been providing reliable and affordable heating and air conditioning repair for home and business owners for over 40 years. Based in Troy, Michigan, we've been proudly serving Oakland, Macomb, and Wayne Counties with same-day, 24-hour emergency service, and unmatched quality in every job we perform. Our company is based on the belief that our customers' needs are of the utmost importance. We provide 24/7 emergency repair service for all makes and models of furnace and air conditioning systems so you and your family can get the comfort you need without the wait. When it comes to solving your heating and cooling problems, we have the experience, knowledge, and state-of-the-art equipment needed to quickly and accurately diagnose any issues. We offer high quality, reliable AC and heating services throughout Southeast Michigan, including Troy, Sterling Heights, Bloomfield Hills, West Bloomfield, Southfield, and surrounding communities in the Metro Detroit area. Not sure if you're in our service area? Give us a call - we're available 24 hours a day, 7 days a week to take care of all your heating and cooling needs. Our company was built around the belief that our customers' needs are of the utmost importance and our entire team is committed to meeting those needs. We have built our business on repeat customers and referrals. 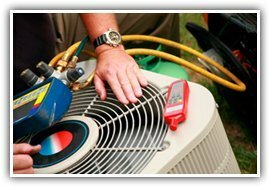 Our specialties include repairs, maintenance and replacements for furnace and air conditioning units. We specialize in the repair and installation of all major brands such as Carrier, Bryant, Lennox, Goodman, Rheem, Trane, Payne, Coleman, and more. We carry all humidifier brands and air cleaners as well. Whether you need repairs, maintenance or a new unit installed, we have you covered. We offer 24/7 emergency service throughout Metro Detroit and Southeast Michigan. Call us today at 248-909-7228 for same-day service or to schedule a FREE consultation! At All Heating and Cooling, we're no strangers to the large swings in temperatures and the strain that can place on your hvac systems. Michigan weather conditions aren't particularly kind when it comes to comfort - or your ac/furnace. Your home's air conditioning or heating system will be working overtime in the coming months to keep everyone in your household comfortable Call us for maintenance service year round, as this is the best way to prevent a system breakdown and AC installation. Don't let an unexpected furnace failure get in the way of your routine and comfort! All Heating and Cooling provides comprehensive furnace tune-ups to ensure your heating system functions perfectly when you need it most. Remember: a warm home is a happy home!